After reading that, I thought the book was going to be about a hunt for the Loch Ness monster. No joke, that’s what I thought I was in for. You see, I never read Water For Elephants, so I’m unfamiliar with Gruen’s writing. I didn’t realize I was in for a story of death, domestic violence, divorce, and effing colorblindness. I don’t know how to sugarcoat it: I was bored. What kept me reading until the end? It wasn’t completely boring. There was some intrigue. And Gruen’s writing is beautiful. She really brought the scenes and historical time setting to life—I could picture everything perfectly. I did not like any of the main characters. In fact, I really had no idea why the hell they were searching for the Loch Ness monster anyway. Three rich kids have a quarter-life crisis and decide to find Nessie? Well, ok. They were all generally unlikeable characters, though I found the supporting characters much more likeable, so they kept me hanging on. My other gripe was the war. It was very awkwardly tied in. Every once in a while it was mentioned in a very random, jarring way. Anyway, I wasn’t terribly thrilled with this novel. I will still give Water for Elephants a chance, though. I rated it 3/5 on Goodreads. 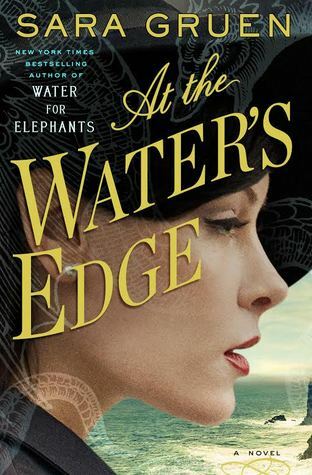 I received At The Water’s Edge through NetGalley and Spiegel & Grau in exchange for an honest review.